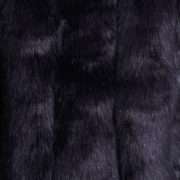 Lumi London navy Boston faux fur jacket. A sumptuous, über furry, über fluffy faux fur coat. This below waist length, jacket is amazing to wear for stylish everyday glam or for creating a glamorous statement with evening attire.